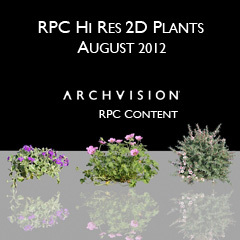 ArchVision is pleased to announce the addition of three new hi-res plants to the RPC Content Exchange. This collection of flowering plants include flowering plant with violet blooms, flowering plant  with bright pink flowers, and flowering plant  with tiny white flowers. Each of these are a perfect addition to any garden or flower bed.